76 drivers ran a Crossflow Cup event in its first year. The series averaged 27 cars per grid with a phenomenal 43 cars running the final event at Sonoma. It was incredible fun, with perhaps best of all, 98% of the series laps run under green. The Crossflow Cup will be back in 2018, but for now here is the story of how it all came down to the wire. Ed VanTassel chasing Don Stern in a typically tight field. 39 cars entered the SOVREN Columbia River Classic. 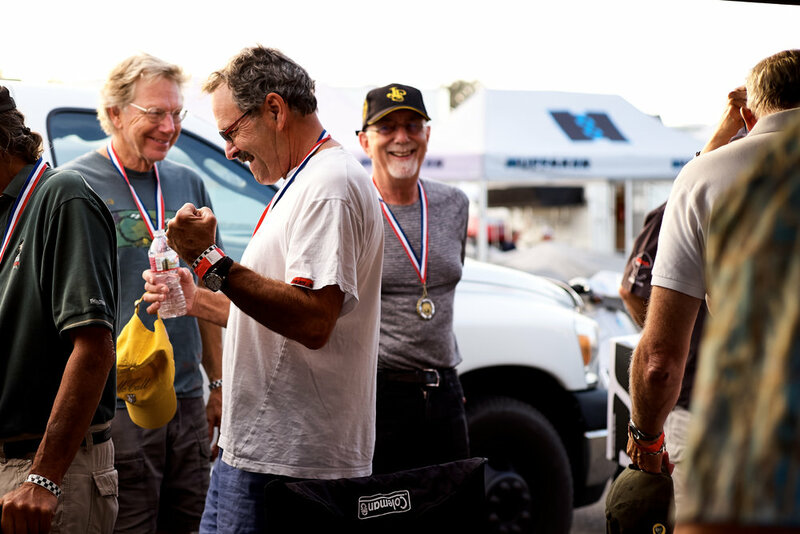 And for about 20 drivers, it was their first taste of Portland International Raceway, but also of the pleasures of Portland, the bars, restaurants, and sights of a truly great town just 5 minutes from the track. The event itself was great fun, with loads of track time (6 sessions) and the All British Meet providing lots to see and do, along with great music and temporary pub pouring pints of great local and English beer. On Friday night we also had a wonderful reception at Ivey Engines, with fantastic food, beer, wine and a tour of the legendary shop. The weekend started Friday with a test day, courtesy of the Lotus Club, where almost all 20 of the visitors got ample track time to figure out Portland. Everyone found it great fun, but a real challenge, with lots of little nuances and subtleties. Lots of drivers went to bed that night wondering how big the gap to the locals was going to be come Saturday morning. In a somewhat unusual format, we had a qualifying session and then a qualifying race to set the grid for the Crosslow cup points race. Qualifying made two things clear. It was going to be tight, and there were 4 distinct groups up and down the grid, separated by tiny gaps. John Hill set a breathtaking 1:23.6, over a second faster than Tom Kreger, who led a group of 11 cars separated by less than a second. Of the visitors, John Anderson and Todd Strong were the fastest qualifiers with a 1:25.4 and 1:25.9 respectively. The qualifying race tightened things up even more with 11 cars running in the 1:25's and the next 14 cars running within a second of each other. But more notable were big improvements from Kim Madrid, Don Stern, Dave Grieger, Jeff Rogers as they moved higher on the grid for the points race. The big shock was Martin Lauber, who up to that point had been second in the championship, had his motor stop and he parked against the wall on the main straight. This triggered a double yellow that changed the rhythm of the race and created more of a procession to the end. Andrew Wait had his shifter break so he retired on the parade lap as did Dave Zurlinden who correctly, sensed a problem with this right front hub. The points race was a tense affair. On the pace lap, a car pulled off and the grid ran 2 laps under yellow before finally getting a green flag. John Hill ran away from the field, eventually finishing almost 12 seconds ahead of the Historic Ford winner Tom Kreger. But behind these two, there were epic races all up and down the field. The leading group of 12 cars all ran laps within a second of each other, and the two following groups ran nose to tail, with the most dramatic finish being Kim Madrid, Larry Bangert, Sherm Johnston, and Martin Lauber all crossing the finish with less than car lengths separating them. Martin Lauber passed 16 cars, earning the fast charger award but finishing out of the points. The eventual Historic Ford podium was Tom Krieger, Nic Colyvas and John Anderson. The Club Ford Podium was John Hill, Quinn Posner and Todd Strong. An enormous field of 43 cars arrived in a very crowded paddock for the 14th Charity Challenge at Sonoma Raceway. 320 competitors, 4000 spectators, an airshow, and spectacular Sonoma weather made this a memorable event. There were drivers coming from as far away as Canada, and the biggest VARA group in memory came to race. Several SOVREN drivers, Chuck O'Connor, Bob Morrison, Don Stern and several others came down to spectate. Also significant, there were 11 drivers with no experience at Sonoma. Friday testing saw a lot of lead follow, coaching and mentoring of new drivers around the most technical track we run all year. It all paid off with everyone finding the line and with 100% green flag racing throughout the whole weekend. Qualifying saw Art Hebert set a sublime 1:47.3, in his Titan Mk 6, surpassed only by Ethan Shippert in his Club Ford who cracked open the 1:46's. But as usual, the grid was grouping into tight subgroups that promised great racing for everyone. Martin Lauber, Todd Strong, Nic Colyvas, Dan Cowdrey, were separated by less than .3 sec. A little further back, a particular a rapid Roger Pujol, John Anderson, John Ballantyne, Dave Cooper, Ed Lauber, and Tom Krieger were all separated by less than .5 sec. And if the less than .1 sec gap between Geir Ramleth, Tom Duncan, Dan Wise, Jay Streets and Tom Lacosta held up, theirs would be the most thrilling race to watch. The competitors rolled their cars to the hot pits/grid and enjoyed a gridwalk, with spectators, friends, and family coming down to mill around prior to getting strapped in and starting engines. The grid cleared and the parade lap led to the best start of the year, a tight well-organized roll in 2nd gear. Organizing behind leaders Hebert and Shippert, there emerged 4 distinct battles. The most exciting was Richard McCloskey, Rob Laroque, Mark Colbert, Jay Streets, Jonathan Kitchen Jim Cody, George Jewett and Jack Wilson all crossing the line within 30 seconds of each other. Unfortunately, Ethan Shippert, Dave Alvarado, Brian Iriks and Alan Dezzani retired with a range of issues. In the end, the Historic Ford Podium was Art Hebert, Martin Lauber and Dan Cowdrey, the Club Ford Podium Todd Strong, Tom Duncan and Eric Inkrott. After 5 races, and a very long intense season, everyone got a participant medal. The final awards for the 2017 season go as follows. We say this over and over. A series like this cannot be run without help, supporters, and sponsors. And also big thanks to the team that helped put this all together. Jim Cody, Kurt Joerger, Ed Lauber, Martin Lauber, Dan Wise, Mike Summers, John Anderson, Cris Vandergriff, Jim Johnson, Geoff Pitts, Jav Ivey, Chris Duranwoski, Mike Wirrick, the SOVREN team, and Jeff Rogers. Paul and Jonathan Kitchen, Don Durbin, the podium Girls, Jenny, Pere and Sandra and our Photographers, Bob Pengraph, Bert McBride and Alvin Lumanian. The boys from SOVREN. Bob Morrison and Don Stern came down to party at the Series Final.